Unfortunately, while in Ghana, I did not have many encounters with the local cuisine. My friends and I mostly found ourselves dining at hotels or restaurants we found online that served familiar salads, sandwiches, pizza, and burgers. While it may not have been local food, it was still incredibly delicious. However, I did have an interesting experience in that three of my friends celebrated their birthdays while we were traveling in Ghana. At each restaurant, we asked if they could bring out a cake or something of that sorts and at all three restaurants, I have never seen such elaborate birthday celebrations. Each restaurant had an extravagant dance planned involving every waiter/waitress in the restaurant. They danced to a local soundtrack and typically danced in circles around the restaurant 2-3 times before landing at the table with the birthday guest. At the end of the dance, a male waiter would grab the birthday girl and dance with her for a while before sitting her back down to blow out the candles. Typically, I would not find this unusual if it had happened in one restaurant, but I found it very interesting that almost the exact same performance happened at every restaurant. This behavior seemed to follow suit with the overall spirited and cheerful attitudes I found in Ghana. My absolute favorite treat Ghana had to offer was the delightful abundance of plantains. They could be served as salty chips, fried like potatoes, or sautéed sweet. They were the perfect addition to any meal, adding a sweet complement to the variety of Ghanaian spiced stews. Traditional Ghanaian “fufu” was unique in itself, distinguishing the West African culinary experience. It is a sticky pounded starch made from cassava root. It looks and feels like fresh uncooked dough but tastes a bit sour like its been fermented. Fufu is used to scoop up other more flavorful dishes and stews and eaten with the right hand. Other staples appeared to be black eyed peas, used to make spiced bean dishes, as well as rice, used in vegetable pilafs. I tried a savory spinach stew that consisted of finely chopped greens and other veggies, uniquely spiced with West African flavor. Additional toppings I enjoyed included tomato based spicy sauces and golden spiced “garri”. Garri is traditionally cassava root flour, but this topping made a lovely spiced sprinkling for any meal. Ghana is known for their chocolate production, so I made sure to try the national delicacy. The best chocolate bar sold in any grocery store or gas station is called “Kingsbite.” This tasty treat tops off the Ghanaian experience. Coco Lounge is a Must! During my short trip in Ghana, I came across a great restaurant, Coco Lounge. It is located in a shopping mall, but this place is very hip and trendy. When you first walk in, you see an old truck that is used as a pizza oven. Right next to it you have a huge bar where you can find drinks as well as pastries. Overall, the ambiance of this restaurant is an A+. It is the perfect place to come to Sunday brunch with a group of friends, or a casual Saturday night dinner with drinks. Moving on to the good stuff, the food. Start off with some “coco bites” or appetizers. The Coco Chips also known as chips and salsa (guac is extra) and the Hummus and Baba Ganoush are great dips that will open up your appetite. Also make sure to get the crispy chicken fingers and the spicy beef skewers if you want some more appetizers. Both come with a delicious spicy sauce that goes well with anything. Finally the wood fired pizza is a must. You can get a seafood pizza, a vegetable calzone, or if you prefer to keep if simple, the crispy & thin mozzarella and tomato pizza will do it. It is the perfect combination of cheesy and crispy – might be one of the best pizzas I have ever had. Also do not forget to check out the drinks and dessert menu if you want to stay here a little longer. If you happen to be in Ghana, you have to stop by Coco Lounge. There are very few things that I get nervous about when heading into a new port or country at this point in the voyage. However, the one thing I was most concerned about for our short time in Ghana was the food. We had learned about certain dishes from class and through our interport student, but I still wasn’t sure on what exactly Ghanaian cuisine would be like. To my surprise I loved everything I ate while in country. On the first of our four days I was on a SAS program that traveled through Nima looking at and engaging with local artists. We met the communities chief, wandered through the mural lined streets and ended our day with a home cooked meal and a painting lesson with the artists themselves! The day was fantastic. Our meal was served buffet style and one by one we got to choose from a plenty of dishes. I choose both the fish rice and white rice, egg stew, fried cheese and tuna, gravy and a “salad”. Maybe it was my exhaustion or maybe it was my extreme hunger at this point of the day but everything was delicious! I think Ghanaian food has exceeded my expectations the most. I did not anticipate liking the foods I would encounter, but I really did. One thing that surprised me was the amount of plantains I ate. On the side of the road, there were people who sell snacks and drinks from baskets on their heads to drivers stuck in traffic. My tour guide brought one of these people onto our bus to sell us plantain chips. I have had plantain chips plenty of times at home, but I had never enjoyed them until I tasted them in Ghana. My tour group stayed in a village outside of Cape Coast. It was a beach town that was quite removed from development. For this reason, we ate all of our meals at our hotel. They served us joloff rice and red red, traditional Ghanaian dishes. Joloff rice is spiced rice that is served in a cone shape. It was very good, but I could only finish a little bit of it. One serving is pretty large. Red red surprised me the most because I hate eating beans (e.g., lima beans, black beans, etc.). I have never liked them, but I really enjoyed red red. It consisted of beans covered in a moderately spicy sauce. This was served with cooked plantains. Unlike the rice, the serving was quite small, perfect for an after-surf lunch. 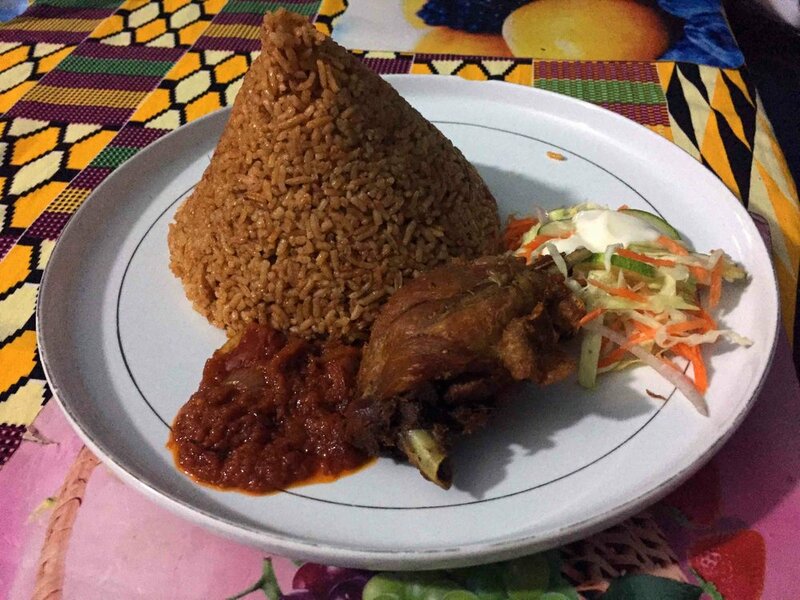 Traditional Ghanaian food consists of chicken, rice, and beans. Despite the bland images that come to mind, it is actually delicious and so full of flavor. Country Kitchen is a great restaurant to go to if you are in Accra and want traditional Ghanaian food. However, if you are in the mood for a more Western restaurant, I highly suggest the Coco Lounge in Accra, Ghana. The atmosphere is chic and aesthetically pleasing. And the food is absolutely amazing – the best meal I had during my time in Ghana. However, the Coco Lounge exceeded my expectations. All of the ingredients tasted so fresh and full of flavor, and reminded me very much of my favorite restaurants back in the states. If you are in Accra and are feeling a little homesick, I definitely suggest going to the Coco Lounge to get some delicious, homestyle food.